Following are some photos from a recent trip I made to East Texas. Nothing out of the ordinary to report but it is a very beautiful place. I hope you enjoy the pictures. Bad Science is Killing Bigfoot? There is a great article by Brian Dunning on the Skeptoid website called Killing Bigfoot With Bad Science. In the article Dunning points out how those on both sides of the bigfoot argument are shooting themselves in the foot using faulty arguments and bad science. The article is a fair one that points out much of the foolishness close minded skeptics use to "disprove" evidence put forth by researchers. Dunning also points out the way some bigfoot enthusiasts hurt their own case by making wild claims that can not be backed up with any evidence whatsoever. I would like to take just a moment to applaud Mr. Dunning for his level-headed and fair approach to the subject. I found nothing to object to in his article and feel that a skeptic who is truly fair minded would feel the same way. Check the article out here. It is well worth the time. 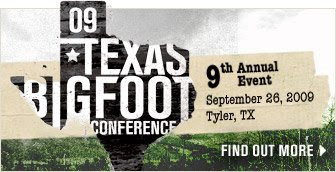 Here's a heads up on the 2009 Texas Bigfoot Conference to be held September 26 in Tyler, Texas. The TBRC has a very impressive group of speakers presenting this year. Check out the details here. My friend Steph has posted a very nice write-up over at her Skookum Qwest blog regarding how one should go about investigating an alleged cryptid sighting. This particular entry deals with an alleged sighting of a small bigfoot-like creature from a moving vehicle. 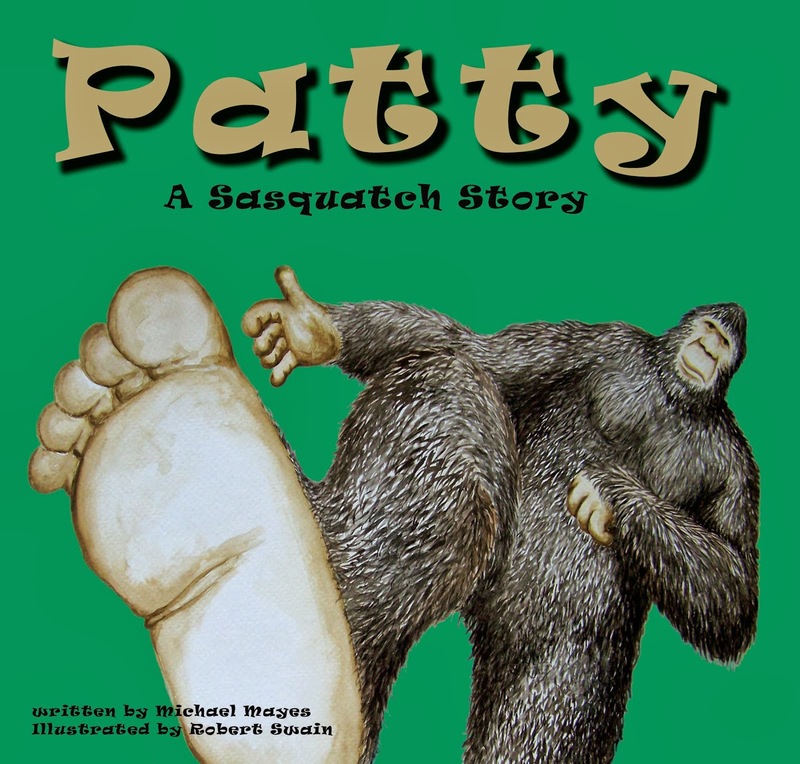 It should be required reading for anyone serious about investigating sasquatch, or any other cryptid, sightings. The write-up centers around a recreation of the incident Steph set up to test what could be discerned by the human eye at 10 mph. 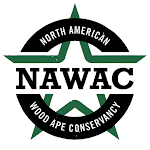 It should be noted that in the alleged sighting that inspired this experiment the witness was traveling at approximately 10 mph and claimed to have spotted a small 28-30 inch tall ape-like creature in a tree about 30-45 yards deep in a wooded area. A video tape of the recreation shows how difficult and unlikely it would be that any one could see so small an animal that deep in the forest while traveling at that speed. Read her write up, entitled Testing Visual Detail Ability at 10 mph, here. I really admire the leg work that went into recreating the scenario described by the alleged witness. I do feel it is possible that the video makes it even more difficult to spot the target than it might be in real life. Distance and depth are distorted by video. All you have to do to realize this is to watch any golf tournament on tv. A green only 175 yards away from a golfer will look like it is a quarter of a mile away on television. 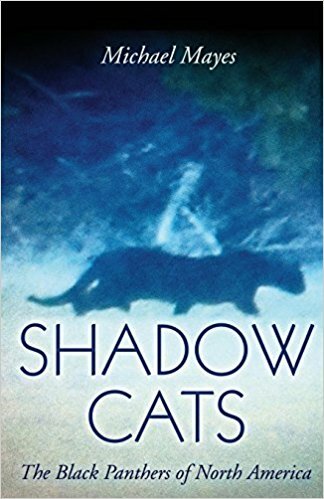 Having said that, however, Steph's point is well taken and the lesson learned from it should not be wasted on anyone serious about getting to the truth about sighting reports. 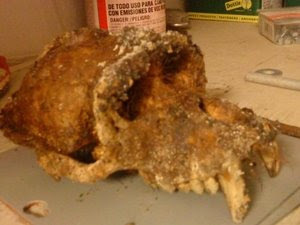 An NBC affiliate station is reporting the discovery of a strange skull made by a plumber working on a construction project in north Dallas. "We all know it's a primate. We just don't know which kind." said David Evans the plumber from Alvarado, Texas who made the find. The skull measures only about six inches long from the front to the back and two inches across. It was buried about five feet deep. According to the report, nearly all the teeth are intact including a pair of one inch long canines. Another small portion of bone, likely part of a femur or hip, was found near the skull and is believed to belong to the same animal. Dr. Dana Austin, an anthropologist for the Tarrant County Medical Examiner's Office said the skull definitely belonged to an "old world primate." This makes the likely candidate a monkey, chimp, or baboon. She said it was impossible to judge the age of the skull from photographs and could not venture a guess as to how it came to be buried in urban Dallas. The story can be accessed here. I will post updates to this story if the skull is positively identified. According to the BBC News website, another interesting, and startlingly human-like, behavior has been observed in one of the great ape species. For only the second time, wild female western lowland gorillas were seen clapping their hands to get the attention of male silverbacks and/or their infants. The article can be accessed here. The behavior was observed and recorded by Ammie Kalan of Oxford Brookes University and Hugo Rainey of the Wildlife Conservation Society at the Lac Tele Community Reserve Project in the Republic of Congo. Their report, published in the journal Primates, includes several episodes of female gorillas using hand clapping to put a stop to certain behaviors of their infants. “A female was able to exert control over her infant’s behavior by hand clapping.” said Kalan. She added, “What struck me most was how it was conducted in such a controlled and deliberate manner while in a bipedal position; much like a human would hand clap.” Kalan went on to say the behavior reminded her very much of a human mother clapping in the direction of a child in order to quickly alter an undesired behavior. In addition to using hand clapping to address infant behavior, two female lowland gorillas were observed using this technique in what appeared to be an attempt to get the attention of a male silverback. Kalan and Rainey twice observed females clapping their hands in what they deemed a clear attempt to, “alert a male silverback to the presence of human observers.” The message was evidently received by the big male as each time the claps were heard he attempted to intimidate and drive off the human interlopers. The silverback’s intimidation displays included loud roaring from behind a tree, drumming on the buttress roots of the tree, and chest beating. Hand clapping as a form of communication has been observed in wild gorillas only twice previously. Twenty-five years ago noted primatologist Diane Fossey observed the behavior in a single female mountain gorilla off an on over a four year period. The only other time hand clapping was observed in western lowland gorillas was an incident witnessed by J. Michael Fay twenty years ago. The observations of Kalan and Rainey suggest that hand clapping is used by these great apes in an effort to communicate over long distances, particularly to the dominant male protectors, and as a way to quickly gain the attention of group members, notably infants and juveniles. Kalan said, “It’s a form of gestural communication that has largely been overlooked by gorilla researchers. The hand clap allows the gorillas to maintain group cohesiveness.” Despite the observations of Kalan and Rainey, hand clapping remains a seldom witnessed behavior in gorillas. This would suggest that gorillas might develop varied methods of communication depending on the specific location and culture of each group. The hand clapping behavior of these great apes is very interesting to me as is the response to it by the male silverback. I have not heard of any accounts where an alleged sasquatch witness claims to have seen the creature clap its’ hands in an effort to communicate with another individual or as a form of intimidation. However, it isn’t too far a leap, in my opinion, to think that the sound of two powerful hands popping together could be mistaken for the wood knocking sounds often reported in the deep woods of North America. Neither does it seem too long a stretch to consider it a possibility that the wood knocking could be a response to a hand clapped alert. The male silverback did respond to the hand clapping female by beating on the base of a tree and drumming its’ chest. It seems possible the sounds generated by these responses could be mistaken for "wood on wood" and account for at least some of the strange wood knocking being heard in the most remote wilderness areas of our continent. It would be interesting to see if reporters of wood knocks heard any other strange sounds, like a possible hand clap, prior to hearing the knocks.